Understand, address, and solve compliance challenges with expert guidance on current EHS laws and regulations throughout our research platform. You’ll find everything you need for planning, implementation, and management. Search for news, compare regulations, and communicate complex information with our centralized database for EHS regulatory and legal information. Review, track, and collaborate with stakeholders across your organization on regulatory activities. Prepare for regulatory shifts through policy maker interviews, along with global news and analysis. In partnership with Bloomberg New Energy Finance and Bloomberg L.P., we’re looking ahead at the ways sustainability initiatives impact facilities all over the world. Information integrated with analysis, full text materials, and objective reporting. Collaborative web-based applications for audit and compliance management with global content. Trust the solution that’s been providing unmatched expertise since the founding of EPA and OSHA. I rely on Bloomberg Environment to keep me up to speed on all the news every day. I would not want to give it up. 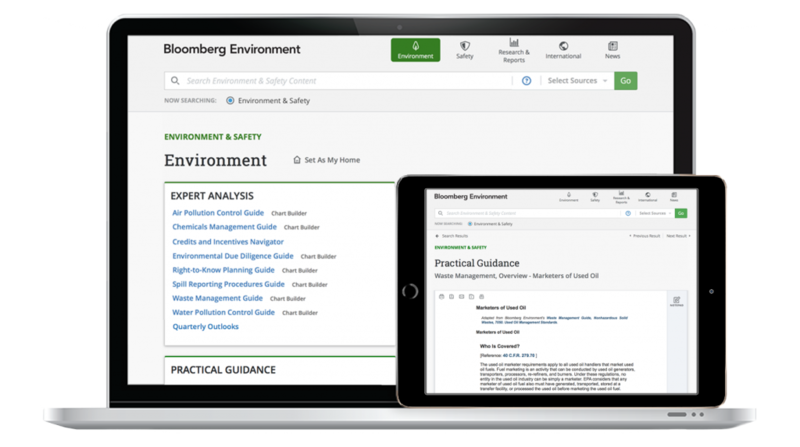 Discover all the ways that Bloomberg Environment can elevate and enhance your EHS compliance program, with tailored resources for any size organization.